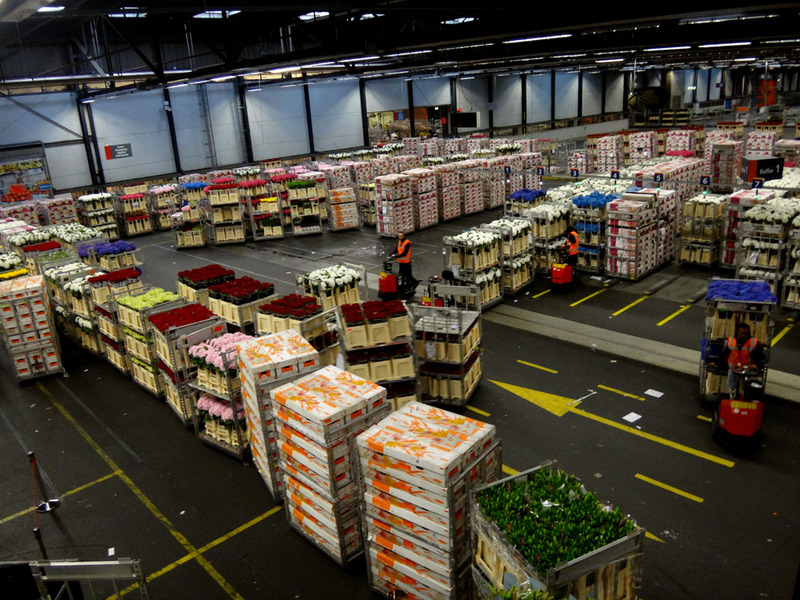 FloraHolland is the largest trading market for flowers in the world. It’s located just outside of Amsterdam in Aalsmeer, is open to the public from 7 -11:00 am, and costs about $6 to enter. The massive warehouse, shipping yard and trading center must be one kilometer long and a few hundred yards wide. Wear your walking shoes and prepare for an unusual adventure into the world of trade in The Netherlands. 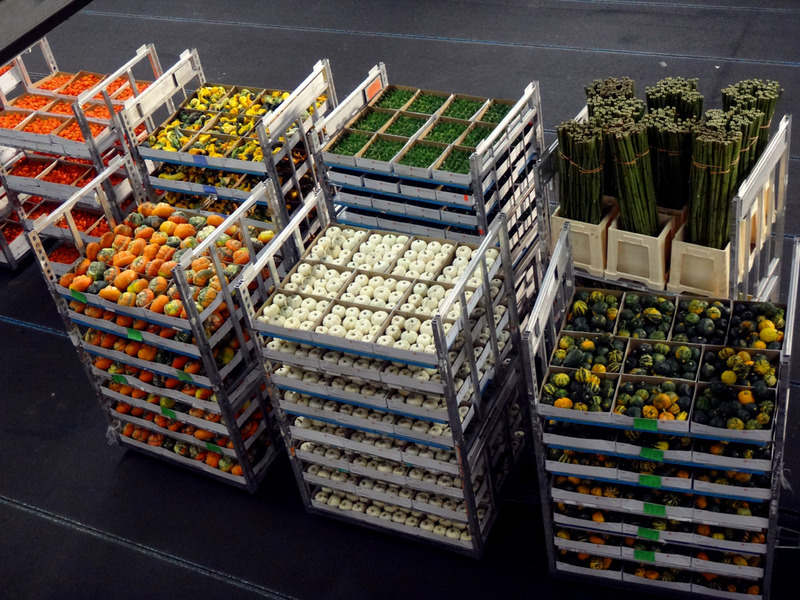 You’ll be rewarded with a new respect for business and the astounding sight of beautiful flowers packed for trade. Even though the just-cut flowers are gorgeous, the story here is about sales, not beauty. 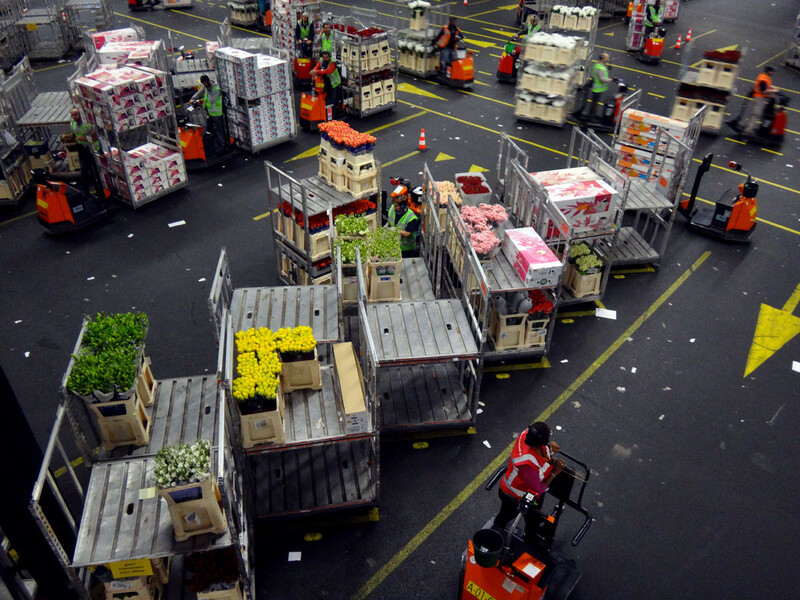 More than 4,000 people work at FloraHolland, participating in the trade of millions of dollars of flowers from all over the world. It is a bustling work place of more than 1 million square yards. The flowers move from field to auction to your home in less than 48 hours. We climbed to the second floor of the warehouse and then walked a loooooong platform high above the action to learn how flowers are packed in boxes according to type of flower or plant or decorative vegetable or grass, then rushed to this trading center (the largest of several flower auctions in the Netherlands), sold off in a Dutch auction, then quickly moved to the brokers for redistribution back out across Germany, england, Belgium, France and other points across mostly Europe. Growers list all the lot information on a form that accompanies the just-picked flowers to FloraHolland. The flowers arrive after the auction closes at 11 am and are placed on trolleys. 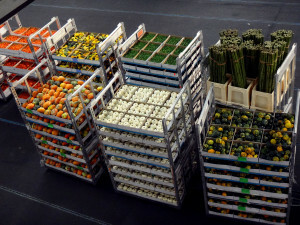 Flowers that need cold are moved to cold storage and plants that need warm are moved to warm storage. Auctions begin at 6 am but this is a 24-hour business. The flowers are brought into the center on long “trains” so the flatbeds pass by loaded with, for example, pink roses. 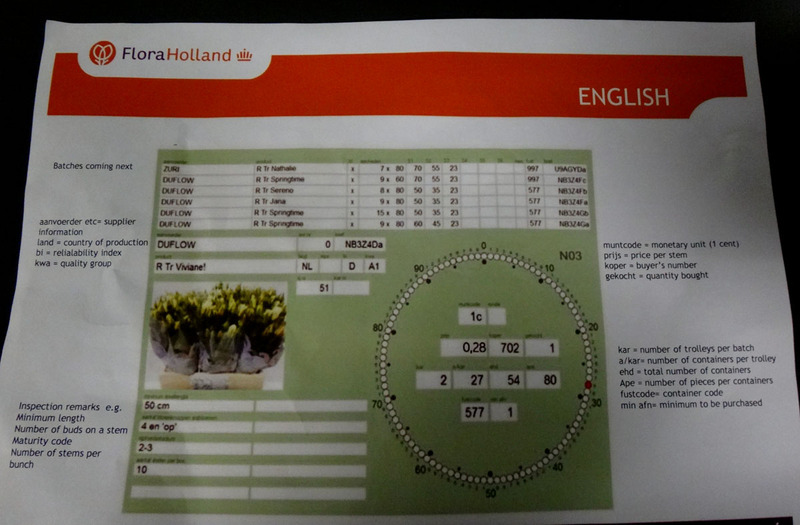 They are inspected by buyers who call up to the auction floor and report on the quality of the plants. 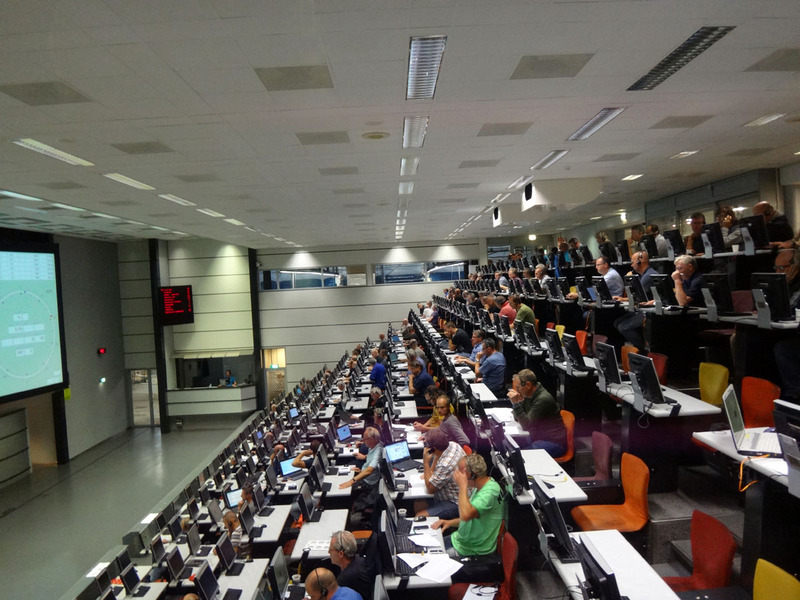 About 120 buyers have seats on the auction floor and sit in a tiered semi-circle staring at two huge round calculators on a screen. Buyers can also participate remotely by internet. Here’s an example of how the auction works. A photo of pink roses appears with a suggested price of, say 29 cents a stem, and a box on the clock screen tells how many cases of roses are available, say 120 cases. 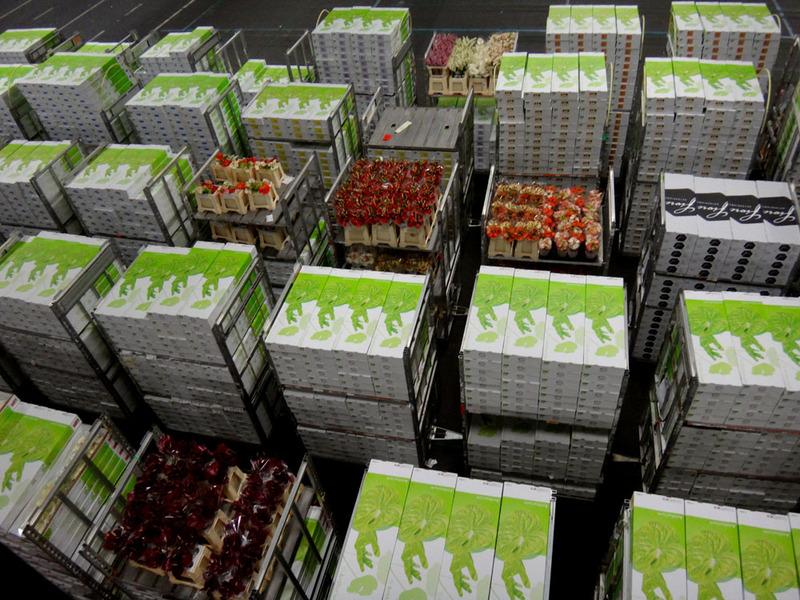 Within seconds, buyers bid at the 29 cent price and also input how many cases they want. As the flowers are sold off, if buyers really want pink roses, the price starts to climb as the quantity starts to drop (think supply and demand). If no one wants pink roses today, the price may start to drop and late buyers may get the remaining pink flowers for 18 cents a stem (or lower) until all the roses are solde. If everyone wants pink roses today, the price quickly rises and late buyers may pay 35 cents or more per stem. 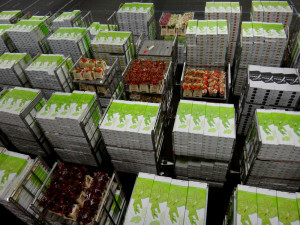 All 120 cases of roses can sell off in about 10 seconds but I saw no auction last longer than 30 seconds. The flowers need to move fast so they can stay as fresh as possible. In a few minutes time, you might see 12 auctions for a dozen different colors of roses followed by 10 auctions for six different colors of irises. The highest priced flower I saw was an almost black iris; it went for 95 cents per stem. The grasses and decorative vegetables are all part of the flower sales. In addition, some flowers arrive already packed in individual boxes so there might be a “train” load of long stemmed flowers in long whiteboxes with gold lettering and a ribbon around the box. 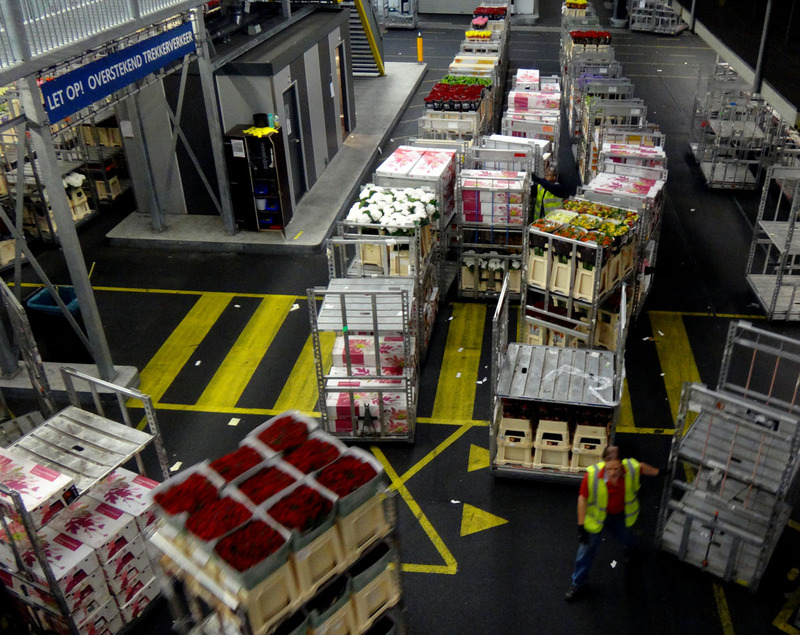 More than 2,500 flowers trains move through the facility each hour. 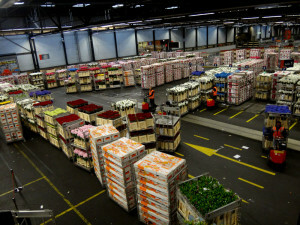 Once the flowers are sold, they are packed into containers for the appropriate buyers and shipped out immediately to points around the world. In this photo you can see where carts are being loaded with the purchases of individual buyers within 90 minutes of their sale. Once the buyer is done for the day – well before noon — the cart is transported to a truck and immediately shipped out to the buyer’s designated destination. 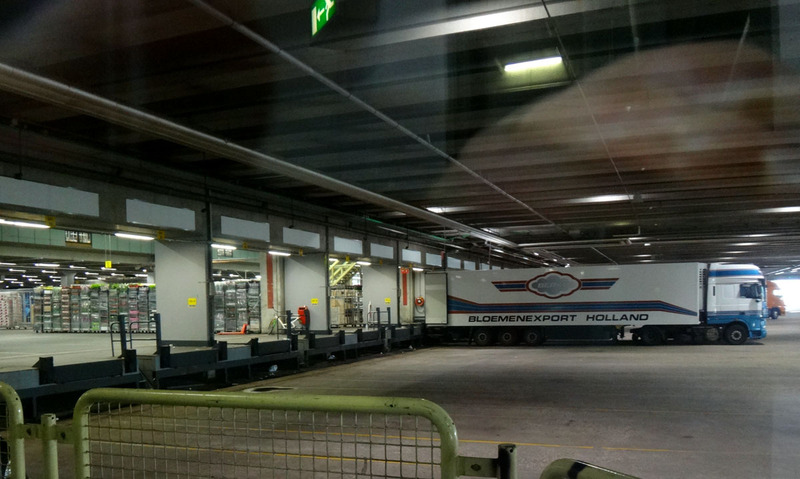 We got up extra early for this experience because FloraHolland opened at 7:00 am, giving us time to tour before heading on to Amsterdam from Wassenaar. 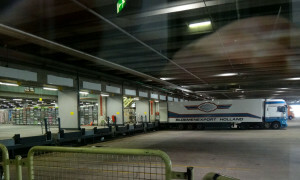 We drove by car and did not see any public transportation as FloraHolland is located on the outskirts of town in a rural/industrial area. The parking lot is on the roof of the warehouses and is so large that it is confusing to figure out where to park and then it is confusing to figure out how to get out of the parking lot when you leave. If you decide to visit, make sure to make note of where you leave your car and how to get to the exit. There is no clear line of sight to see where the ramp that leads you off the building’s rooftop is located. You’ll eventually figure it out but pay attention when you drive up to the roof. This is a must-see attraction and I’ll be back to visit again. It’s definitely a marriage of beauty and business.